I am an expat living in Brazil. 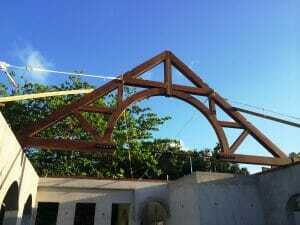 I am almost ready to start construction and will be using ipe for the trusses. Hard as a rock and really strong. The stock is 8cm x 12cm and 8cm x 16 cm. How is the best way to join them. Keep in mind the house is on the ocean and exposed to salt air from one of the saltiest areas in the Atlantic and a tropical windy climate. Your best bet is to have a look at our joinery pages, or maybe buy a book on timber joinery. It can be pretty complicated stuff. All the joinery is designed to resist the tension or compression forces in particular members. We design the joinery after completing an engineering analysis of the frame which takes into account the buildings location – designing for wind, snow or seismic loads as well as the dead load of the building and the live load of the contents and occupants. Ipe is a great wood – good luck with your project! Invest in LOTS of diamond blades and bits! It’s a beautiful wood but extremely heavy (tripling your foundation costs as well as requiring a pretty hefty crane to move major timbers around on site) and it’s a very, VERY dense wood…weighing some 76 pounds per cubic foot. It’s impossible to get it to hold stain or paint. Left raw it turns a lovely silver/gray over time.